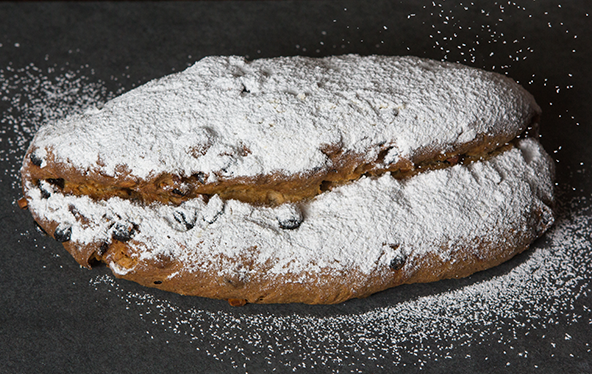 Stollen is one of my favorite holiday breads. 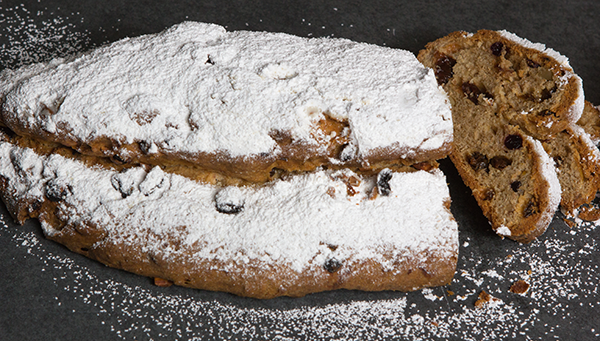 There is a lot to love: fruit, nuts, almond paste, powdered sugar topping – Yum! A quick preferment of milk, yeast and flour gives the dough a nice depth of flavor, and the whole grain flours make everything taste richer, nuttier, and more complex. This is a very silky dough, easy to work with; the trick is always adding in the fruit and nuts without causing a lot of tearing and ripping. Just be gentle and you’ll be fine. My favorite flour blend for this is to use Hard Red wheat for the sponge and Hard White wheat for the dough. There is something about having some hard red flour in a bread mix that always makes me happy. I can only ever describe it in musical terms, like that strong bass note, acting as the anchor. If we stay in symphonic mode, then the hard white flour is there to keep things a little lighter and more lyrical, supporting the frequent soloists – cherries, apricots, currants, almonds. 1. 30 minutes before mixing dough soak fruit and make sponge. In a small saucepan, put liquid and dried fruit. Bring just to a boil, cover and let steep for 30 minutes. Alternately, the night before you can place your dried fruit in a bowl, add liquid, cover with plastic wrap and let sit at room temperature until ready to drain and mix. Gently warm milk either on the stove top or in a microwave, add yeast and flour. Mix well, then cover and let sit in a warm place to become puffy and active. -In the bowl of a stand mixer fitted with the whisk attachment, whisk together eggs, sugar, honey and salt until mixture is pale yellow and forms a ribbon, about 5 minutes. Add the orange zest, vanilla, cinnamon and cardamom to combine. Add Sponge and switch to the dough hook. -Add all flour and butter and continue mixing on medium until dough comes together and builds some strength, about 5 minutes. We fold our fruit into the dough, but you can opt to drain the fruit, add it to the stand mixer and mix on low just for a minute or so to incorporate – too much mixing at a high speed will break down the softened fruit. To fold in: Turn dough out onto a very lightly floured work surface. Pat into a large rectangle. Sprinkle/press fruit and nuts evenly over dough; fold over and gently knead to bring dough together. 4. Gather dough into a ball, place in a large oiled bowl, cover with plastic wrap and let rise until doubled in size, about 45 minutes. 5. Line 2 baking sheets with parchment or silpat. Arrange oven racks to accommodate baking both loaves and preheat to 350˚F. Turn dough out onto a lightly floured work surface and knead slightly to incorporate fruit and nuts. Divide into 2 equal pieces, then flatten each piece into a large oval. Fold one half of the long side of each piece of dough over, but don’t make the edges meet, keep the top edge just short of covering the bottom completely. *If using Marzipan or Almond Paste, roll it into a log, place just off the center of your rectangle and fold top half over to cover it. Let proof until puffy and almost doubled, about 30-40 min. 7. Bake until nicely browned and internal temp reaches 190˚F, about 35 minutes. Remove from oven. While still warm, brush tops of loaves with butter-twice-waiting about 10 minutes between brushings, then coat generously with powdered sugar. Coating with butter locks in moisture and helps adhere a nice, thick layer of powdered sugar to the bread.